Vikings and dragons, oh my! 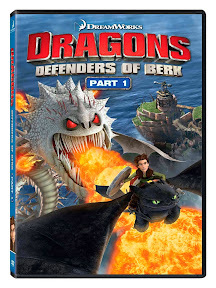 In the third DVD installment based on Dreamworks Animation’s Annie Award nominated Cartoon Network series based on the Oscar nominated CG blockbuster How to Train Your Dragon, we pick up right where we left off in the previous two-part title Riders of Berk with the even more adventurous follow-up Defenders of Berk. The first installment of a season spanning collection that includes the second season’s first ten episodes, Defenders puts you right in the middle of the action as we find our young heroes taking matters into their own hands to help protect their island home, regardless of whether or not they have the blessing of their chief, who just so happens to be the father of our lead. Forbidden from flying their dragons following the perilous experiences depicted on screens both big and small (which likewise help build anticipation for Dreamwork’s upcoming second feature film installment of their planned trilogy), the headstrong young Viking characters originally adapted from the young adult book series by Cressida Cowell set out on their mission under the cover of night. 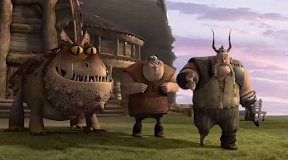 In doing so, they form their own Fight Club-like Dragon Flight Club wherein the first rule of Dragon Flight Club is that there is no Dragon Flight Club confuses some of the IQ challenged young members of the Berk Dragon Train Academy. Yet almost as quickly as they get that first rule straightened out, the members are discovered by Chief Stoic. 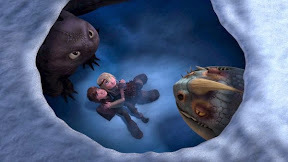 Surprising his son Hiccup, Chief Stoic reveals that even though he’s angry as a father that his son disobeyed him he recognizes that as a chief, he was wrong to not let the talented academy students continue working on what they do best for the good of the people. And as the audience discovers, this decision is reversed precisely at the right time as via a clever diversion that fools everyone but the suspicious Hiccup, the evil Alvin and his henchmen have already taken advantage of the situation to plant the seeds for what promises to be a dangerous uprising. 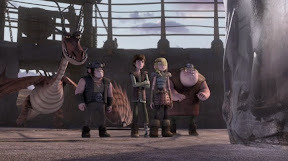 Threatening the very heart of Berk from below its caves by leaving a group of Whispering Death eggs behind to be hatched, the stage for battle is set by the end of the very first episode of this briskly paced, gorgeously animated, high-flying adventure series that soon finds the Academy students putting their training aside to defend Berk for real. With Jay Baruchel and America Ferrera heading up a gifted voice cast of performers reprising their roles from the film and enhancing the world established in the hit feature with all new characters and talented artists, Berk continues the tradition of quality set forth in the previous season. While some of the crass Renaissance fare style humor is sure to play better to boys (as well as girls willing to overlook occasional gross-out sight gags that liken lava to vomit for example), because the caliber of not just the visual storytelling but the emotionally engrossing Joseph Campbell style mythic hero’s journey paradigm is so consistently high, Dragons is a decidedly worthwhile investment. Moreover, it’s a terrific addition to family entertainment libraries that – much like the previous discs – will help prepare viewers for the upcoming How to sequel slated for June by reacquainting us with the characters both in terms of how much has changed as well as stayed the same. 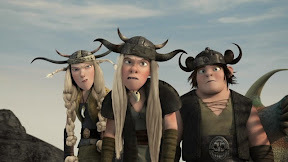 While most TV adaptations pale in comparison to their big screen counterparts, refreshingly not only does Berk live up to the original film but likewise it does an incredible job of continuing the coming-of-age journey of the characters that made the books upon which the material is based so compelling. Also boasting a handy Ultraviolet digital copy code that enables you to bring the two-disc set with you on the go without any heavy peripherals save for a Wifi ready device, not only does Defenders make the wait to June far more bearable but it also provides your children with quality entertainment they can enjoy and learn valuable moral lessons from along the way.